Us dogs can either love or hate water, just as I imagine it is for you humanz. But, just ’cause we may not like being’ thrown into a pool, that don’t necessarily mean we won’t like playin’ along the beach. Gettin’ to go outside and spend time with the family along the water is fun, even for us dogs! We’re like kids though. Spending time near the water takes a bit a preparation to make sure us pups stay comfortable and safe. Check out these summertime water safety tips for dogs! It don’t matter if we are big or little dogs, some of us might be uncomfortable around water. We may need our humanz help gettin’ used to the new experience. I like runnin’ through the sprinkler on a hot day, but I’m still undecided. I’m not even that fond of the kiddie pool. But, my brother Ozzy and sister Brandi, whoah – them two must be part fish! They love it! Heck, Ozzy even sticks his head COMPLETELY under the water! He comes out shakin’ his head and water goin’ ever which-a-way! That boy REALLY loves the water! Taking your dog to the beach, river, out on a boat or even around a pool requires a little preparation. Use these water safety tips for dogs to help your dog have fun, and keep everyone safe near water. Before any new activity, it’s smart to check with your vet to make sure that your dog is healthy and fit enough to take on some new fun. Even when it just comes to a casual walk near water, you never know if your dog will be put in a situation where paddling, or several minutes of intense physical activity, is required. Several pet trainers also offer classes for introducing your dog to water in a safe and calm manner. For some dogs, fast moving water is intimidating and having a still water introduction helps get them comfortable. If you want to introduce your dog to the water yourself, think slow and calm, with a slow flowing creek or shallow kiddie pool that is easy enough for everyone to wade through. Taking the dog along for a paddle or boating trip is fun when your dog is used to the water or shows no timidity on a boat. Still, it is important that you provide the dog with a personal flotation device meant for dogs, especially on large bodies of water. Strong swimmers tire out fast in choppy water or when attempting to assist others. In the same way you would watch for signs of danger in the water for yourself and your children, watch out for the dog as well. Strong tides, debris in the water and fish or jellyfish that can cause harm and pain are all common water dangers. Your dog’s curiosity can end with a sting or bite if you don’t keep a close eye on your pet. Being near so much water and having fun sometimes makes us forget how fast we can tire out. Make sure you provide clean drinking water for your dog and share the shade you find. Dogs can become overheated even around cooling water and clean drinking water is always a must! A dog’s natural curiosity and desire to play means that you need to supervise them at all times. Even if you only need to step away for a minute, it is better to take the dog with you. Pools should have toys retrieved before stepping away in order to prevent the temptation a dog might have to jump in and retrieve it. Even then, make sure you practice entering and leaving the water, so that if your dog is ever on its own, it will know how to safely exit a pool, get back onto a boat or climb onto the dock. Great article, I learned a few things I didn’t know! Thanks for sharing! 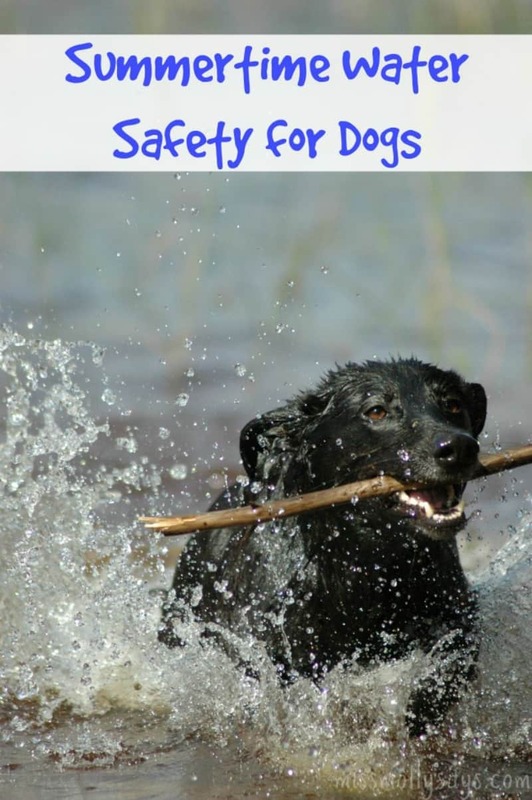 All dogs are different and this is good to point out with the water safety tips, too. Great tips. My neighbors could learn a lot from this article.